I love the Moto G.
For price and quality, no Android phone comes close. It’s three times cheaper than one of those plastic SAMSUNG Galaxies and at least twice better (see, I’m always hyping it). 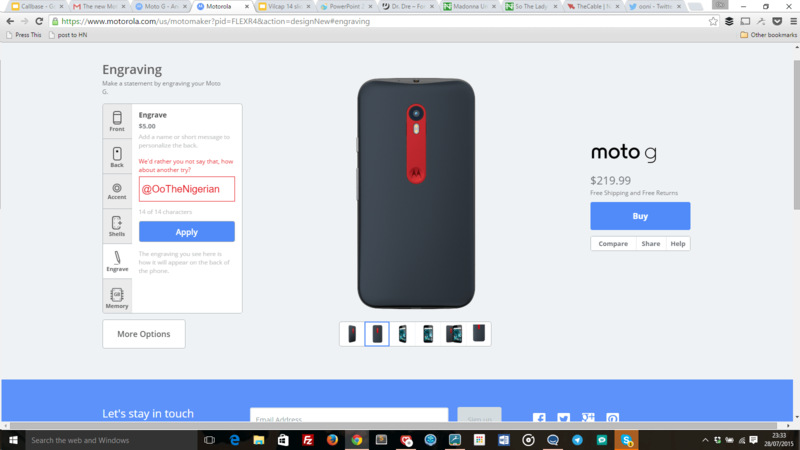 I have proven my love for the Moto G with my pocket and the number of referrals I’ve made that turned to sales. 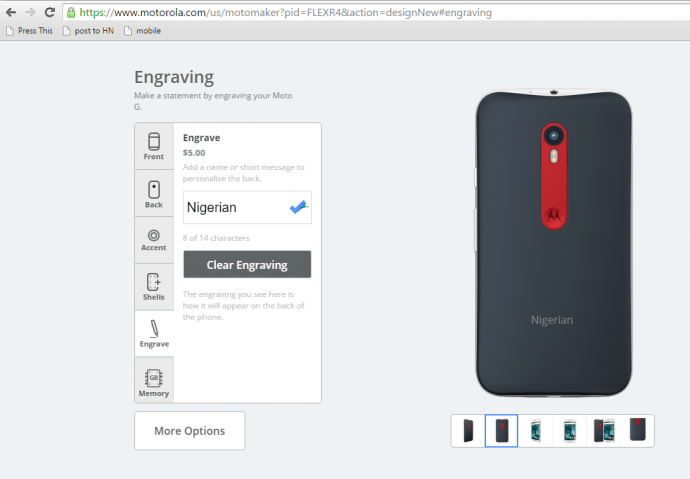 This post is not because of my love for the Moto G but my sadness that the love is not reciprocal simply because I’m Nigerian. 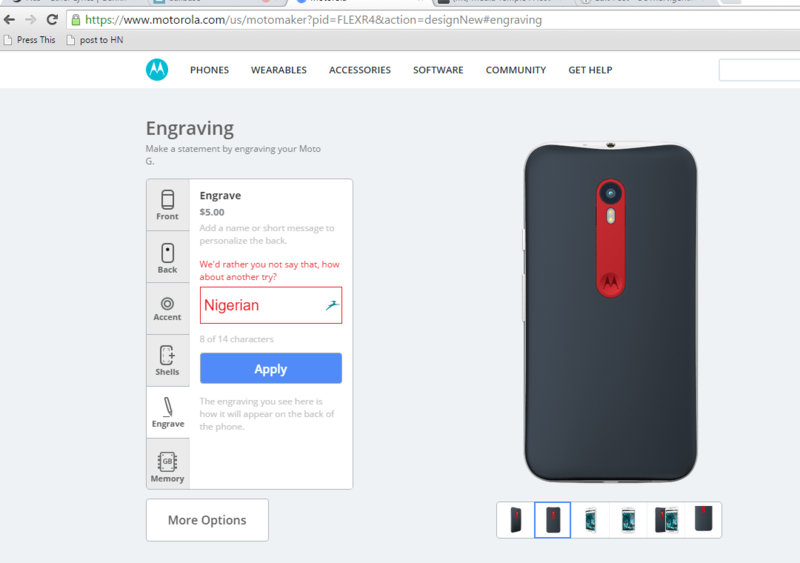 After my phone broke, I decided to step down to “use Infinix hold bodi” until the new Moto G comes out. Two days ago it did! Kai! Even Lil Ghana. Chai! I’m not angry or offended because it was not done deliberately. 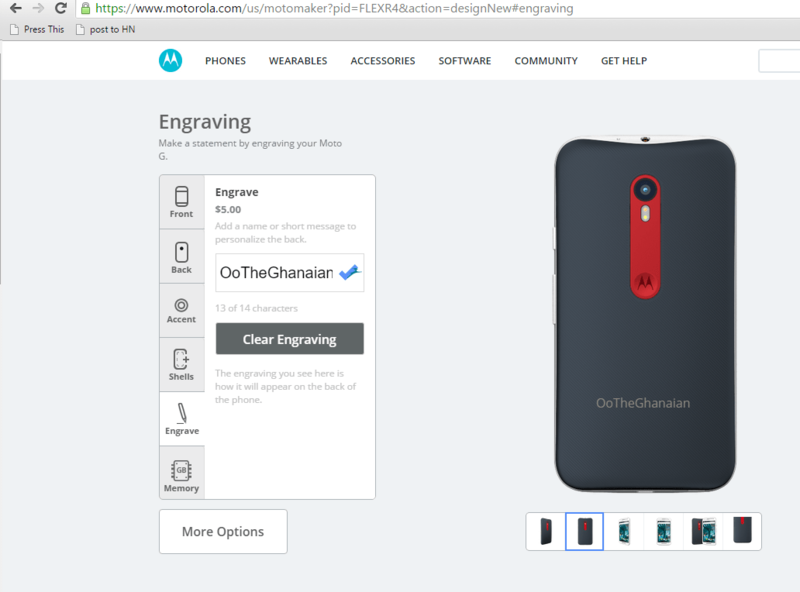 What most likely happened is the database/algorithm they are using to do the naming has blacklisted “dirty words” The Moto G site just used what was there. Anyway, we need this corrected. Prejudice is when Algorithms don’t want nothing to do with you. We Nigerians experience prejudice everyday offline on the immigration lines and online when trying to transact on eBay, Use PayPal or even peruse OkCupid (Don’t judge me. I dey do research). It is why I give special kudos to our folks who make it eventually especially in tech and outside these shores. 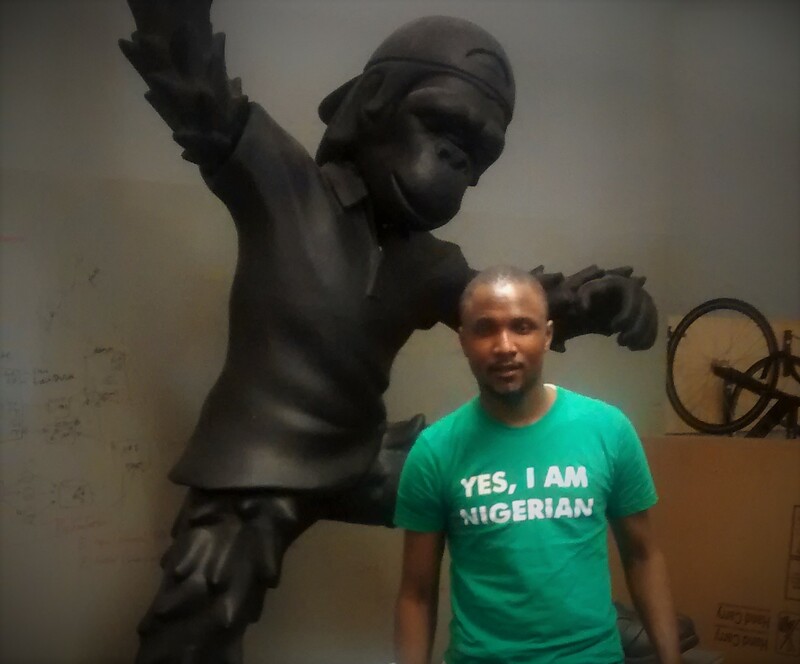 But, as they push us back, we march forward with all the pride and arrogance we can muster :D.
As for my “Yes, I Am Nigerian” tee, I made the first version when I traveled to “the west” for the first time. UK to be precise. I noticed how countenance changed once it was “found out” I was Nigerian. First experience was at the airport. I decided to make a tee shirt to give an advanced warning :D.
Thanks Banke for helping me proofread. A Mike Jones reached out and informed me the word Nigerian is now accepted. You can click this to give them a shout out. Is Google To Blame For The Android Fork Up? Recently, Amazon launched the Kindle fire . Also confirmed is that the kindle Fire would be running Amazon’s own version of Android which will be fully customised to integrate with Amazon’s services. And of course – their own App Store. In the early days of Android, companies like Motorola and Samsung bet their future on Android, in return for getting a ‘free’ OS which would compete with the iPhone’s. In return for the free OS they distributed Google’s services around the globe. Note: You cannot use an Android phone without a Google email account and all the services that come with it. "this will be the first fully-integrated software stack, including an operating system and middleware, being made available under the most liberal open-source license ever given to mobile operators and handset makers"
Although looking back, that statement seems technically correct (most liberal does not necessarily mean liberal, but relatively more/most liberal), handset manufacturers were soon to find out Android is not really that open. This time around Android, I think this strategy has backfired. As time progressed, big hardware manufacturers realised that Android is open in a different way. It is only after a new version of Android has launched that you would have a chance to peek in. That might be ok for entities like Cyanogen mod, but not for companies that want to be at the bleeding edge, when you have companies like Apple pacing away. Of recent, Google Android and some of its partners have been getting challenged quite a bit with patent issues. HTC is fighting Apple in various courts around the world while Samsung cannot sell their 10.1 tablet in Europe. In the spirit of "protecting Android", Google has had to fork out (pun intended) $12.5 billion to buy the Mobile arm of Motorola, inadvertently competing directly with their partners. The CEO’s of their partner companies were so pleased with this move that they said the same thing when it was announced. Now with Amazon and Baidu opening the way, I predict other companies will start forking Android left, right and center. I tip Samsung to be the next. For Google: Initially, the ‘Free and Open’ strategy made sense. They could offset the cost of developing the Android OS with the money from ad’s (getting people to use Google services and displaying ad’s there) however, these forks have messed that plan up. Both Baidu and Amazon are stripping the OS from those Google applications that normally come with the Android phone. Now Google may have to pay if they want to have their search and other apps default. In the case of Baidu a search engine, the response will be LOLZ . I am guessing this gives Microsoft an edge the down the line, to be the second most reliable OS to develop for after Apple’s. Overall, I think the good that might come out of these forking problems is that the web would be the most reliable platform for the delivery of web application services via HTML5. So is Google’s Chrome a fall back strategy? The Gmail Chome App is done pretty well and Chrome Remote Desktop gives a glimpse of what the Chome OS can be. Thanks to June for helping me edit this post. Update: My good friend (Dan Monsieurle Aka Mled) commented with the solution. Just try signing into the YouTube app with the account you want to sync and it will automatically add it to the list of your accounts. Kapish! The best solution is almost always the easiest. I got my Motorola android phone a little while ago and I am encountering my first problem which is making me really really angry and here is why. I just launched my new startup Lotaar which has brought with it the need to create my new email address. 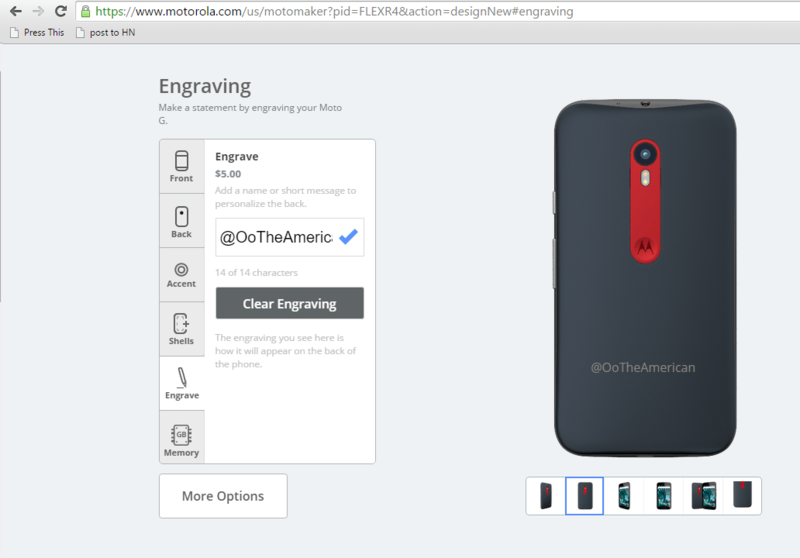 I tried doing the sensible thing of adding the email account to my Motorola milestone and it gave me an error. Ha! call Google customer care? I have a better chance of grabbing launch with Barack Obama than getting anyone at Google on the phone. So I did the sensible thing and Googled for a solution. To my chagrin I discovered that the problem I am having has been around for about a year and more annoying is the fact that the scores of complaints on the Android forum have gone ignored! So for the next few days, I will be cut off using email with my mobile while I ponder a way out. If I was in a large organization the costs will be greater. I now appreciate much more the value of Microsoft and their proprietary software. If it was a problem with them, it would have been solved by now. Meet Adam, The ‘iPad Killer’! It’s not a tablet, neither a book reader. It’s a new species, and we call it ADAM. The First. Specification wise, Adam beats the iPad in so many ways! It has a camera, plays flash, has a longer lasting battery, e-ink technology (it allows you to read under sunlight and is the only advantage the Kindle has over the iPad), HDMI, it even has a rear touchpad Arrington fantasized the iPad would have. More importantly, Adam uses the Android OS meaning it has thousands of applications that will work with it from day one. Simply put, Adam is a great guy. Please see video below. * Save the money on marketing and subsidise the product cost. Then make the tablet go viral using an affiliate marketing scheme or multi level marketing. I am sure they are smart people and would have though of all that. I really wish them the very best success possible. One more impressive thing, Adam is made in India!